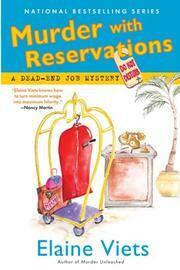 The murder of a coworker threatens to expose a hotel maid hiding from her greedy ex. When an idiot family-court judge awards half of corporate exec Helen Hawthorne’s assets to her philandering husband Rob, she ducks under the radar with a succession of low-pay, no-paper-trail jobs—store clerk, dog groomer and now maid at Sybil’s Full Moon Hotel in Fort Lauderdale. And as if cleaning whipped cream out of the Jacuzzi in the honeymoon suite weren’t gross enough, Helen pokes her nose into the hotel’s evil-smelling dumpster and finds the body of fellow scrubber Rhonda Dournell, who’d hoped to escape her dreary life with the help of a well-heeled boyfriend. When hard-nosed Detective Bill Mulruney grills maids Helen, Denise and Cheryl, and front desk clerk Sondra, Helen knows it won’t be long before Rob—who’s already called her old boss at the bridal shop posing as a lawyer with a million-dollar inheritance—catches a glimpse of her on TV. Her new boyfriend Phil urges her to stop hiding and fight Rob in court while neighbors Margery and Peggy deflect Rob as he snoops around the Coronado, Helen’s low-budget digs. But Helen knows she’s treading water, especially when a second killing launches Mulruney’s probe into overdrive. Brave Viets (Murder Unleashed, 2006, etc.) preps by actually working the jobs she describes in loving and hilarious detail, giving her offbeat series a healthy balance between the banal and the bizarre.